The 10 suites at Hotel Savoy – located close to Ku’damm and Savignyplatz – have played host to countless celebrities over the years. In the course of 85 years, the courteous staff at Hotel Savoy has dealt with many unusual requests – everything from dogs traveling alone to kitchenettes for preparing baby food. Countless treasured anecdotes are proof of just how unique some of our guests at Savoy Hotel have been – guests whose private wishes we tend to better than anyone else. The unique atmosphere of our suites is highly inspiring. 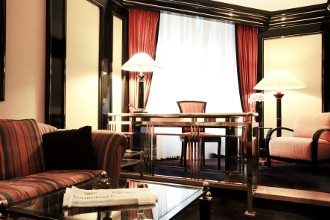 The suites provide a spectacular view of Berlin’s western center or into our bright and spacious garden courtyard. Some suites can be combined with a Superior double room. The luxurious suites of our grand hotel provide walk-in closets with large safes, stereo systems and marble bathrooms with Jacuzzis, golden fittings and marble columns.